Like Barclay Perkins, Whitbread produced quite an array of Stouts. Extra Stout, judging by its name and strength, was designed to compete with Guinness. I’m also pretty sure that this was the Stout they exported to Belgium. I say pretty sure. Replace that with totally sure. 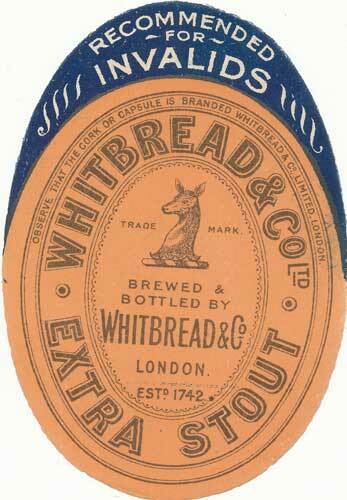 I remembered that I have photos detailing Whitbread’s Belgian trade. They exported three beers: Pale Ale, Extra Stout and – here’s the surprise – Double Brown. From the specifications, Whitbread Extra Stout looks very much like it’s intended as a direct competitor to the Guinness beer of the same name. That had a very similar strength. And, despite being a beer often brewed in a foreign country, adhered to the final set of price restrictions from WW I by having an OG around 1050º. Distinctive features are the short boil time – just 75 minutes – and Polish hops. Looking at historic UK beers you eventually come across every type of hop ever grown in the whole world. But Polish hops are pretty rare. Does the small percentage of oats mean the usual?